My first view of Chittor was on a winter morning. Dawn was yet to break when our train entered Chittor station. As I stared out of the window bleary eyed what caught my eyes were serpentine rows of lights up on a hill and a well lit clean city with wide roads. I was smitten. 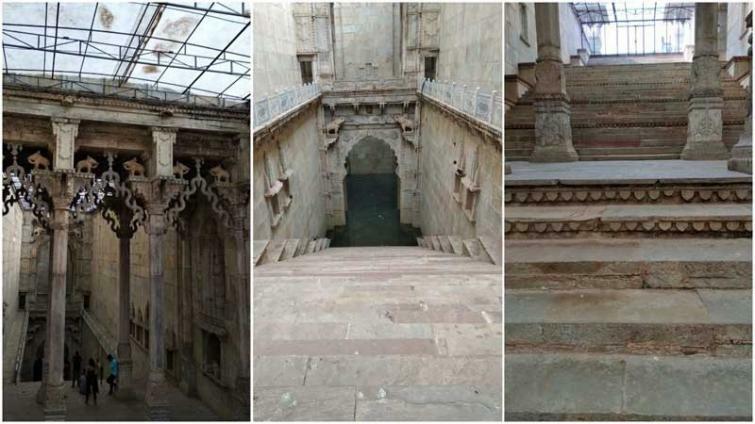 Chittor, the very name conjures up images of valiant Maharanas and warriors, the beautiful queen Padmini and the ruthless Allauddin Khilji. We reached Chittor early on a December morning and after settling down took an auto rickshaw to visit the fort, a UNESCO World Heritage site. Possibly one of the largest in India, it sprawls over a hill 180 metre high and spread over 280 hectares. Chittorgarh, or citadel of the brave, reverberates with tales of valour and romance. 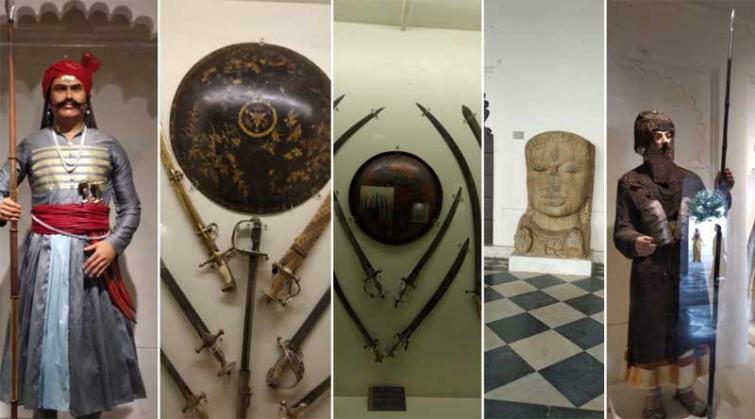 The massive fort is regarded as the best in the country and undoubtedly has a glorious past. The fort was ravaged thrice, but each time the indomitable spirit of Chittor rose like a phoenix and regained its lost glory. Allauddin Khilji was the first to sack Chittor in 1303, lured by the beauty of Rani Padmini. Subsequently it was plundered by Sultan Bahadur Shah of Gujarat in 1535 and Mughal emperor Akbar in 1567. The serpentine road to the fort is rather steep and exhaustive. Chittor fort is approached through seven huge gateways or 'pols'. These are guarded by watch towers and massive iron spiked doors. Allauddin Khilji lurked in my mind as we proceeded. Did he know about this massive structure when he planned the siege? He wanted to pluck the beautiful queen out of her palace and place her in his harem, so besotted was he with her charm even before laying his eyes on her. He tricked the king, Rawal Rattan Singh, and captured him. A long battle ensued at the end of which Rattan Singh was killed. The lovely Padmini and other noble ladies committed 'johar' or self immolation to save their honour. 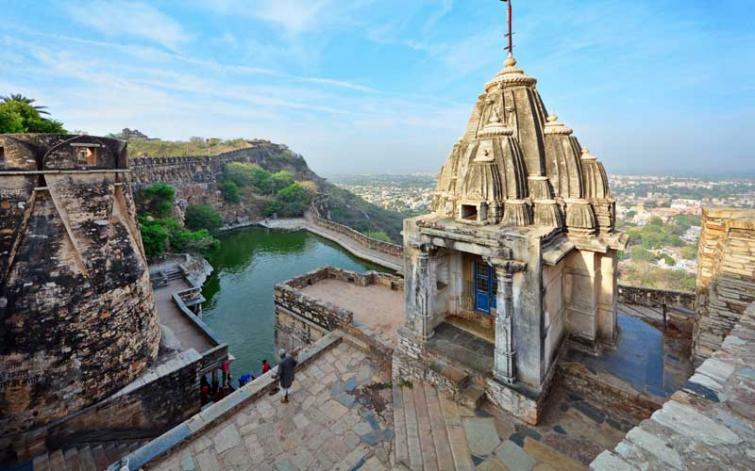 Chittorgarh has had a chequered history from the period of Bappa Rawal to Maharana Pratap. Bappa was only 3 years old when his father Naag Eedar was killed by the Bheels. His mother took Bappa and sought refuge in the family of descendants of Kamalavati Nagar of Badnagar community who had saved the life of Guhol, the first ancestor. Young Bappa was introduced to saint Hareet Rishi who worshipped the idol of Shree Eklingji placed beneath a bush. In fact, we came across a small, dilapidated, forlorn temple with a sign nearby saying lord Eklingji's temple. With his guru's blessings Bappa subsequently came to Chittor to stay with Maan Maurya and finally dispossessed him of the throne to become the ruler of Mewar. Did the toppled columns, broken walls, the caved-in roofs and collapsing steps speak of the once weary battles, I wondered. For, the magnificent fort is almost in ruins. But from the ramparts one can get a spectacular view of Chittor town down below. The surrounding Aravalli range and the greenery completes the picture. 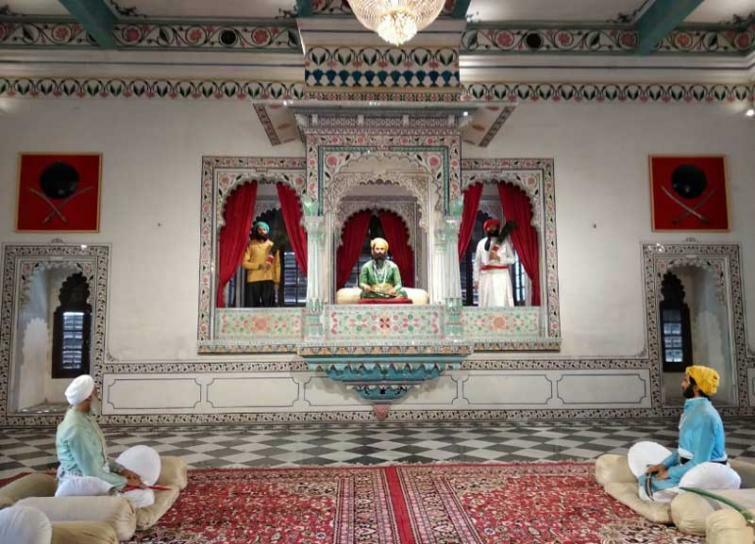 Within the fort is a treasure trove of Rajput architecture. Notable among these is the 11th century Jain temple. The pillars are opulently carved reminding one of the famed Dilwara Temple of Mount Abu. An architectural feat is the Vijaya Stambha or Victory Tower. This imposing monument was constructed in 1448 by Rana Kumbha (he has a separate palace within the fort). The 122 feet structure is adorned with life-like engravings depicting Pauranic gods and goddesses. Rani Padmini's palace is situated towards the end--a solitary white structure on a pond. The palace is said to be studded with huge mirrors. 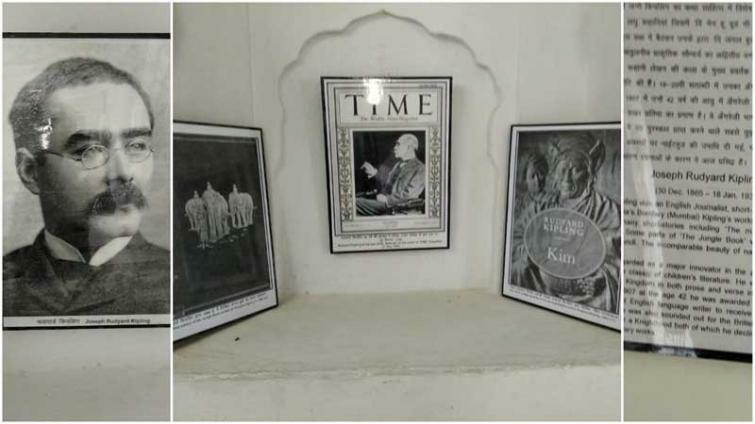 History tells us that Khilji spied Padmini's reflection on the mirrors. Some say he saw her reflection on the clear water of the tank. Another place of interest is the museum within the fort. It was a later-day addition and certainly worth a visit. We had reached Chittor on December 11 when rival Congress snatched power from the BJP in Rajasthan. I could not help wondering at the significance of battles old and new, lost and won. We next visited Bundi, around 155 km from Chittor. We changed bus at Kota. The journey was uneventful, sparse like the surrounding. Named after Bunda, a Meena chieftain, Bundi is a colourful, ancient town. We immediately fell in love with the lively, bustling place. Bundi's bazaars are a treat to the senses. 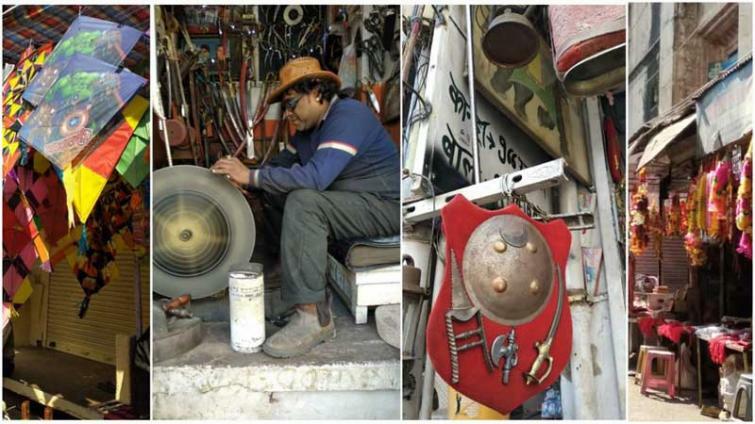 Shops selling colourful kites of varied shapes and sizes vie for attention among the brilliant 'Bandhni' sarees and garments, dazzling bangles and metal artefacts and utensils. Confectioners preparing and selling sweets and savouries will entice you. The tea seller beckons you with a smiling face and folded hands. And the whole area is chock-a-block with people, motorists and cows. The roads are narrow but for some strange reason the motorcyclists prefer to drive at break neck speed. By some divine grace they do not crash into bovines and humans. The people are extremely friendly and helpful, perhaps valuing the tourists. During our stay we dined at two homely places--Jay Cafe and Shankar's Cafe. The food was simple yet tasty. At Jay's his sister is the chef. Shankar's Cafe is strategically located beside the Nawal Sagar Lake. At night we would eat beside a bonfire, the flames valiantly trying to ward off the chill, while Shankar's cousin regaled us with local tid bits. 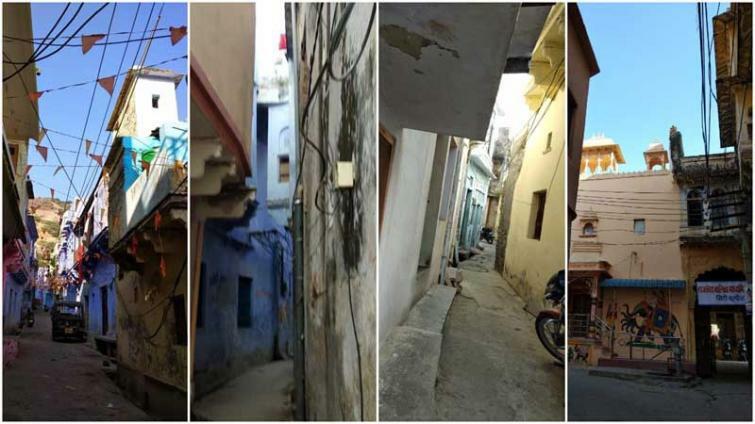 Bundi's alleys can spring surprises. Pedestrians, bikers and mendicants expertly negotiate the lanes, not breaking into duels if they perchance bump into each other. The dry dessert dwellers spice up their surroundings with bright paintings on the walls. 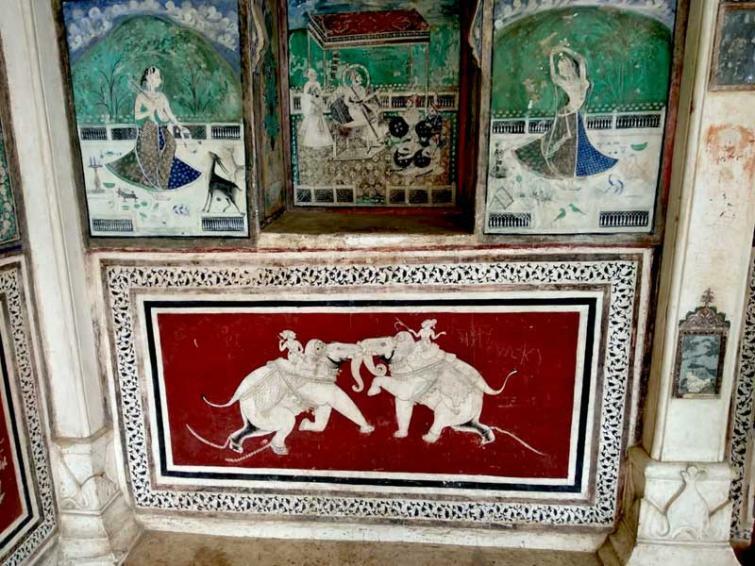 Elephants and birds to svelte lady are painted on house fronts, while the colour scheme of others could be mauve and orange to blue, green and yellow. Bundi is encased by the Aravalli hills on three sides. It is protected by huge walls with four gateways. A medieval fort and the majestic Bundi palace, also known as the Taragarh Fort, look down upon the clear waters of the Nawal Sagar Lake. The Taragarh Fort, atop a hill, was built by Rao Raja Bar Singh in 1411. An outer wall was added by Fozdar Dalil of Jaipur in the 18th century. Unlike most other palaces in Rajasthan there is very little Mughal influence in its architecture. But it is desperately in need of repairs and upkeep. You have to climb a steep paved carriageway to reach the main palace. At some places the stones are loose and extreme caution is advised. While coming down, which is rather treacherous, we saw some people give up the idea of visiting the palace. 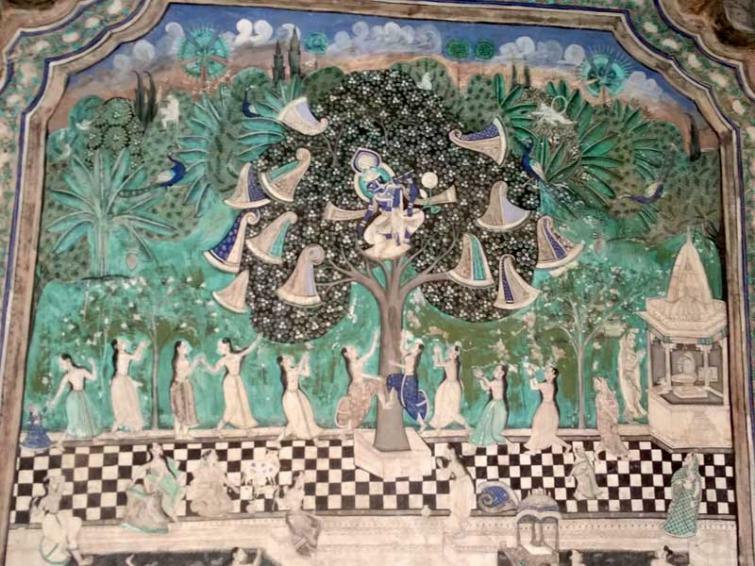 The Chitrashala within the Garh Palace has mind-blowing frescoes in the miniature style depicting 'Ragmala' and 'Raslila' of Radha and Krishna apart from scenes of battles and courts, flowers and plants of every conceivable shape. Turquoise, blue, green, red and yellow have been used against a white background, lending an ethereal feel. At stretches the walls look bejeweled. You would almost want to touch it. And there are people who throw caution to the wind. But a guard is always around to dissuade those bunch of rule-breakers. 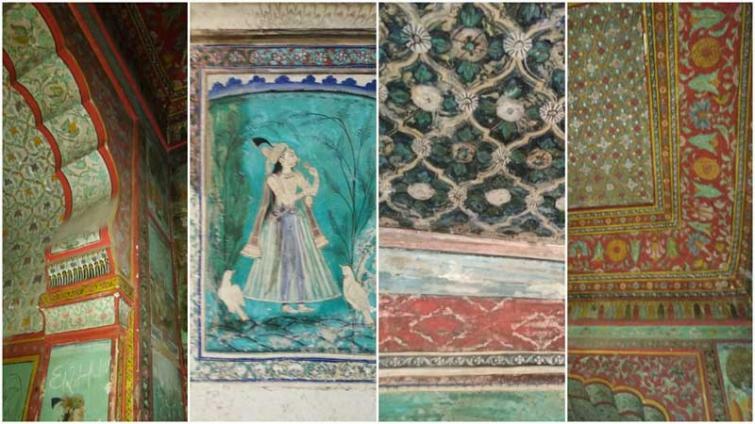 Though the Archaeological Society of India looks after the Chitrashala, the frescoes are badly in need of restoration and preservation. Taragarh Palace still remains a private property. The heritage structure is crumbling and decaying. And it is up to the government to ensure that this wonderful edifice continues to stand tall. 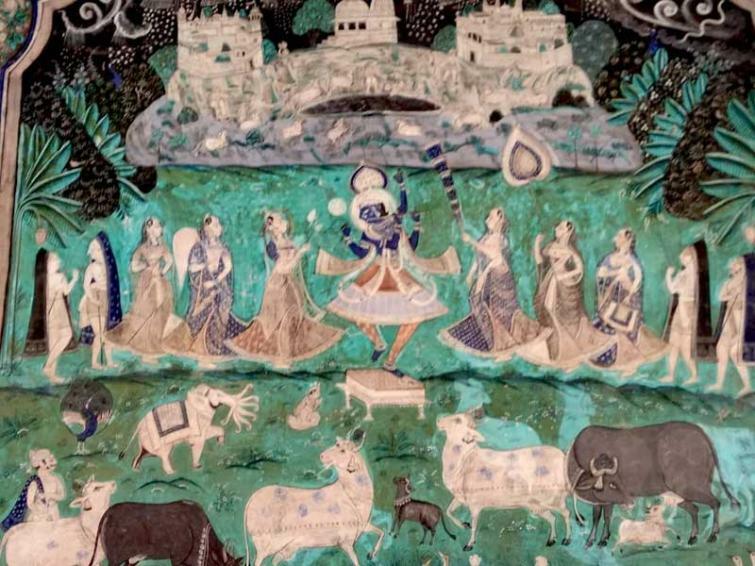 Bundi's claim to fame is its miniature paintings. 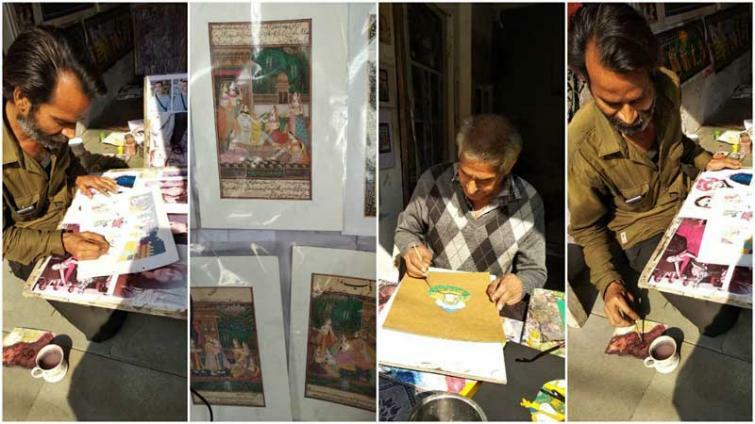 You can see artists immersed in work in their simple shops, transforming a sheet of white paper into a work of art. Among other places of interest are the Sukh Mahal on the banks of the Jait Sagar lake which houses a small but impressive museum. It hosted Rudyard Kipling for two days. The beautiful lake may have been the Nobel laureate's muse. The museum has some exquisite 9th and 10th century sculptures. The Rani ji ki Baori just outside the city walls is a 46 metre deep step well with high arched gate and carved pillars built by queen of the royal house. There is also an 84 pillar cenotaph built by Rao Raja Anirudh. Any write up on Bundi will be incomplete without a mention of the Mango man--Geet who sings with his craft. 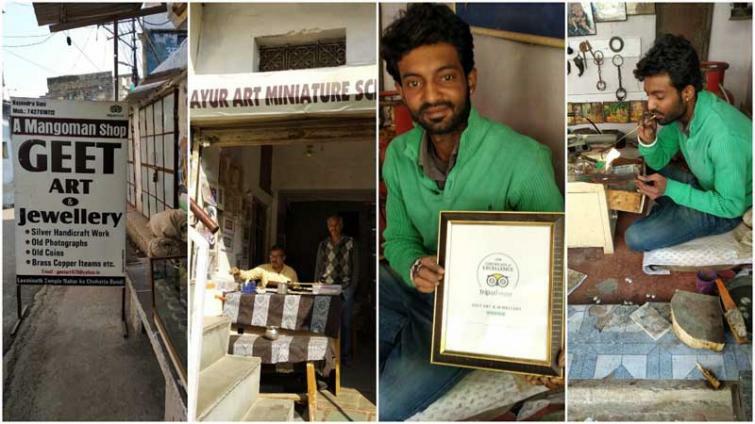 He creates beautiful mango-shaped silver pendants and other jewelry at his shop, often teaching interested visitors, mostly foreigners the tricks of his trade. The Trip Advisor says he is the second most important after the Bundi palace! In Bundi bazaar there is a man who weaves magic on his loom in his shop named Kota Doria. He sits the whole day spinning out lovely dupattas and sarees made of fine cotton and silk. A few buys from his shop is a must.